Preheat the oven to 180°C/Fan 160°C/Gas 4. Heat the oil in a large frying pan. Skin the sausages, break each one into a couple of pieces and flatten them slightly into little patties. Fry the sausage patties for a couple of minutes on each side until seared, then remove them and set them aside on a plate. Add the onions to the frying pan with a pinch of salt and a splash of water. Fry them until they’re starting to soften – a few minutes – then sprinkle over the flour. Stir until the onions are completely coated with the flour. Add the stock, together with the herbs and Worcestershire sauce, and simmer until the liquid has thickened. Grease a large casserole dish with some butter. Divide the potatoes into 3 batches and arrange the first batch in the base of the casserole. Season them with salt and pepper, then add half the sausages and half the black pudding. Pour over half the gravy. Arrange a second layer of potatoes over the sausages and black pudding, season again, then add the remaining sausage, black pudding and stock. Top with a last layer of potatoes, then dot with butter. Press down each layer to get rid of any gaps. Put the lid on the casserole dish and cook the hotpot in the preheated oven for an hour. Remove the lid and cook for a further 30 minutes until the potatoes on the top are crisp and golden. Good served with some spring greens. 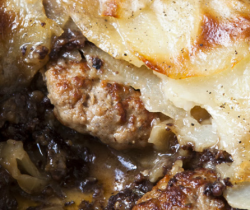 Lancashire Hot Pot and Black Pudding by the Hairy Bikers.